The gloomy weather shows no signs of letting up. The weekend was misty , murky and mundane except for some hoisin chicken I made. Doesn’t that sound like fun? Yes it was. The other day, I saw some pictures of hoisin chicken in Peanutts blog and drooled. Instantly decided I need to try this sauce. I picked up a bottle on my regular shopping fix at the grocers and I have to say, not disappointing at all! Let’s try a positive statement. It‘s exquisite! The recipe on Peanutts blog called for steaming the chicken but I did my own thing. Her recipe looks scrumptious and was helpful to understand how much of the sauce I can add without totally messing up. Please click on the highlighted link to reach her page. If there are any authentic ways of cooking with hoisin sauce I am in the dark of the same. Today’s recipe has nothing to do with authenticity but a lot to do with fun, both cooking and eating. The chicken was marinated for a couple of hours and stir fried with vegetables that I picked up on random from the refrigerator. They were the misplaced, running around kinds who were looking lost in my vegetable tray, needing help. I spruced then up with some trimming and tossed in. 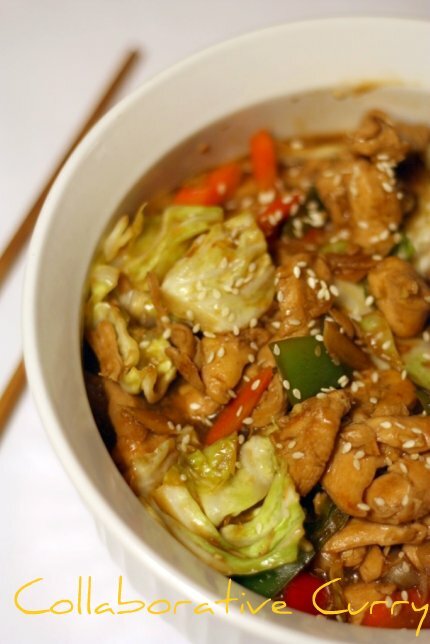 Following, I thickened the sauce, pouring over the cooked chicken and vegetables and sprinkling with sesame seeds to close the deal. 3. Spoon them out and in the remainting oil proceed to saute the vegetables like bok choy, cabbage, bell peppers, broccoli, cauliflower etc. I have used cabbage, bell peppers and carrots. 4. Add some more of all the three sauce just enough to spice up the vegetables. Just a little is fine. 2. Avoid or reduce green chillies. I like the dishes hot and add quite a few chillies. This one was quite piquant so reduce the no of chillies if you like your dish mild. 3. 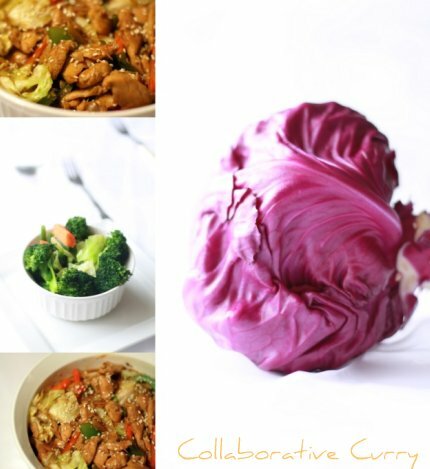 I like cabbage, bok choy, peppers, broccoli or cauliflower, celery, scallions etc in the chinese style dishes I make. I have never used potatoes for example in these preparations and so cannot vouch for it going well even though I tend to loosely state add vegetables of your choice. yummy...this looks just out of the restaurant!! wonderful ! wow a chinese dish! !looks superb..
What a delicious dish!!!! I'm going to make it soon!!!! am hearing the name of the dish for the first time but the picture looks superb...exactly the way restaurant food is presented. lovely dish and great picture. Chicken looks so delicious that I feel like having it now. A very unique recipe. Wonderful presentation. I am game for anything that looks like stir fried chicken any time of the day. With all those veggies this looks so good. That's a nice n tempting cuisine! What a splendid chicken dish you have just created! Excellent photography. Looks very tempting & very tempting click! 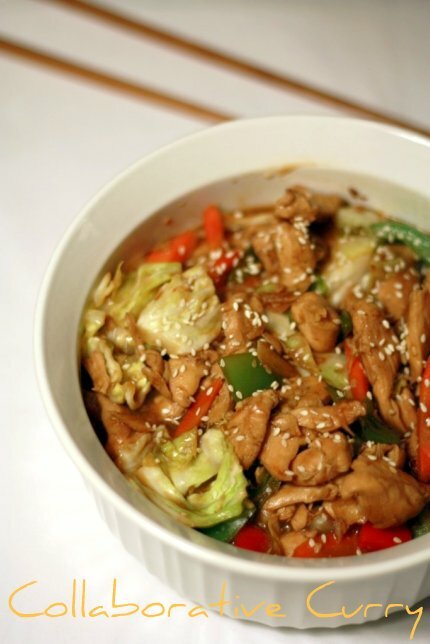 Tempting and mouthwatering Hoisin Chicken...excellent click..
Wow , that looks yummm, Thats the best thing about blogging i think , I got the idea from Food4tots and spiced it up and now you have taken it further and turned it into a whole new dish :). Hoisin sauce is nice for cooking. I used them in bbq. Added your link in my peteformation blog. Cheers! Oh that is a great stir fry! I don't think there are any rule of using hoisin sauce :) well done! Deliciou and Yum dish! Beautiful click! I love the flavor of hoisin sauce and this dish sounds just excellent! The look says it all! am sure it would've tasted superb!! I wish I could make my food look so pretty! Oh the weather, anyways just another day and we are into the snow blizz... Anyways to comfort that the veggie filled hoisin chicken mmm very interesting and love the sesame on top!!! I usually use hoisin sauce only while grilling, this sounds new and interesting!! I love hoisin sauce and am pretty sure I have never prepared it in any authentic way. But who cares so long as it tastes as delicious as this looks! I love stir fries with Hoisin in it!! Your dish sings to me! !